I’m snowed in! First we got snow; then we got freezing rain; then more snow. Frosted ice! Here’s the view out my kitchen window.. So nothing sounded better than putting a big pot on the stove to simmer all day. I’ve actually been collecting the ingredients for a good broth for months now. Back in October, I made Chinese chicken wings; for my recipe, you don’t use the wing tips, so I cut them off and froze them (a dozen of them!). Then, a couple of weeks later, I boned some chicken breasts and poached them; I threw the raw bones into a freezer bag. My big Christmas turkey ended up, picked clean, down to a bag of bones in the freezer. And when I cut up Rex the Rabbit for braising, I ended up with some bits and pieces of backbone, also bagged and frozen. 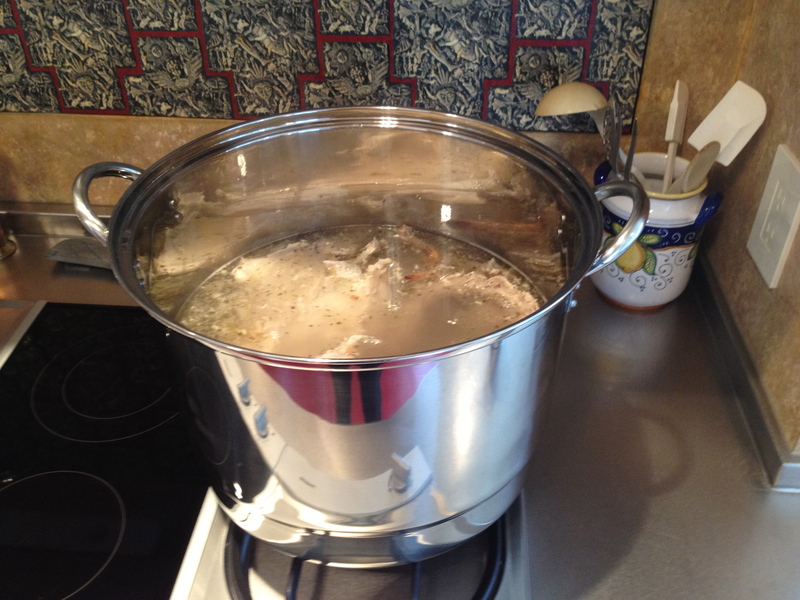 Into the pot!–raw and cooked, chicken, turkey, and rabbit. Stock is made basically from bones, bones, and bones (cooked, roasted, or raw), with enough water to cover them. Add a mirepoix, which is just a mixture of chopped onions, carrots, and celery (equal to about one-fifth by weight of the bones). Simmer forever! Then in the last 30 minutes or so, add a sachet of bay leaf, parsley stems, cracked pepper, thyme, and garlic clove. I cooked my stock for a total of about seven hours, skimming it and stirring it occasionally. I added no salt; since I had brined the turkey, it had salt enough. Then I strained it through cheesecloth. I ended up with almost two gallons of stock! With this mix of ingredients, it’s not an elegant stock, but very flavorful. I used a big ladle of it to make a soup for my early dinner, with frozen peas and toasted croutons made from last week’s rustic bread. 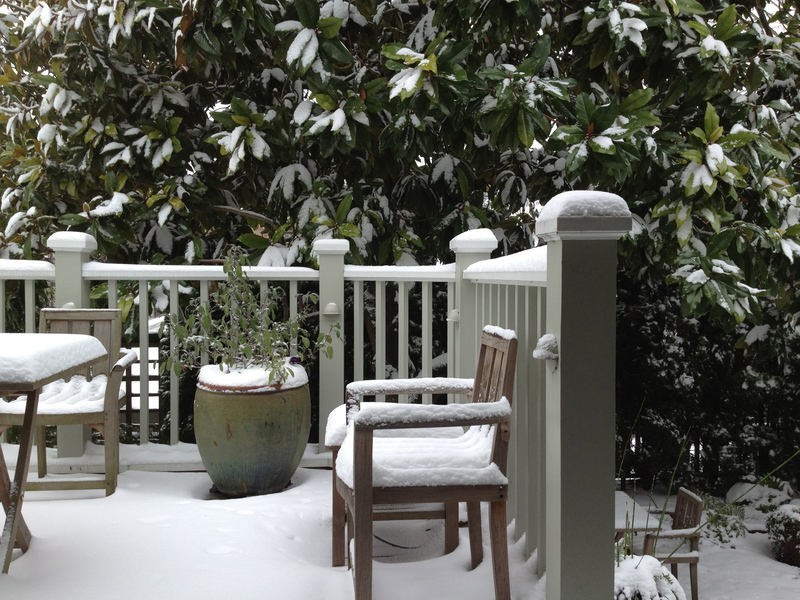 I ate it sitting in my warm and fragrant kitchen, watching my icy garden slip into darkness.